Escommes is on the summit of the canal on the Saone side. This once busy hamlet is now a sleepy place with very little activity, no shops and not even a cafe. When the commercial barges where operating, this was a bustling little area as cargos where prepared to pass through the tunnel. When the tug boat was operating, the barges would have to wait their turn to be tugged through the 3.3 kms of tunnel. 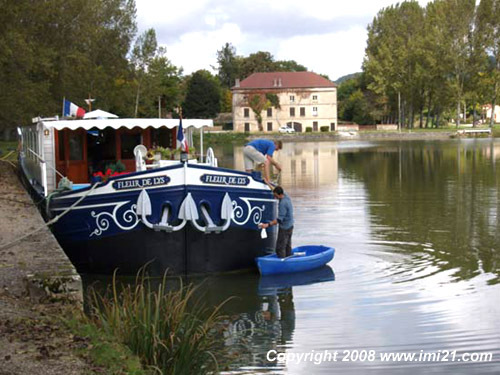 If you have just cruised upstream from Saint Jean de Losne, you have arrived at the top of the Burgundy canal and after going through the tunnel, you’ll begin your descent to the the river Yonne and Seine once you arrive in the town of Pouilly en Auxois. Otherwise, if you have just come through the tunnel, then you will begin to cruise downstream to the river Saône. Whichever, as you pass through lock number 1 at Escommes, prepare your navigation papers, as they will be requested if you want to pass through the tunnel, and make sure you have working navigation lights, life-jackets etc. There are no shops and just a few houses, a very tranquil mooring which you’ll share with a few cyclists and fishermen. Escommes is a very interesting place for people interested in barging techniques. There is a “loading dock”, once used to transport empty barges through the tunnel; the turbine house which once provided “hydro electrical” power for the electric tug; an irrigation canal from the reservoir Chazilly, an overflow canal to send water to the reservoir of Panthier. An sluice gate system to send water into a canal, which in turn passes beneath the Burgundy Canal, and into the turbine house. The port is a very calm place to stay (a preferred place for the local carp fishermen). The mooring on the left side are deep and there is water and bollards. A wonderful luxury barge moored at the port of Escommes in October, the crew are cleaning the hull and preparing for the next cruise. 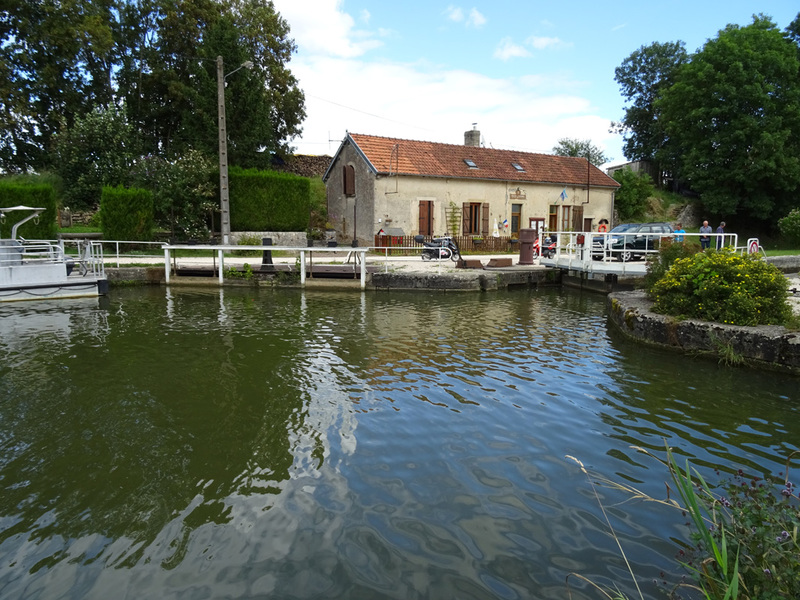 If you cruise down stream, there is a small flight of locks (a total of 9) to the village of Vandenesse en Auxois.